Baum and Smith, both professors evolutionary biology and researchers in the field of systematics, present this highly accessible introduction to phylogenetics and its importance in modern biology. Ever since Darwin, the evolutionary histories of organisms have been portrayed in the form of branching trees or “phylogenies.” However, the broad significance of the phylogenetic trees has come to be appreciated only quite recently. Phylogenetics has myriad applications in biology, from discovering the features present in ancestral organisms, to finding the sources of invasive species and infectious diseases, to identifying our closest living (and extinct) hominid relatives. Taking a conceptual approach, Tree Thinking introduces readers to the interpretation of phylogenetic trees, how these trees can be reconstructed, and how they can be used to answer biological questions. Examples and vivid metaphors are incorporated throughout, and each chapter concludes with a set of problems, valuable for both students and teachers. 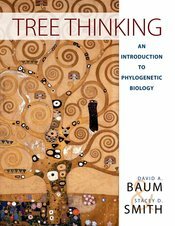 Tree Thinking is must-have textbook for any student seeking a solid foundation in this fundamental area of evolutionary biology.